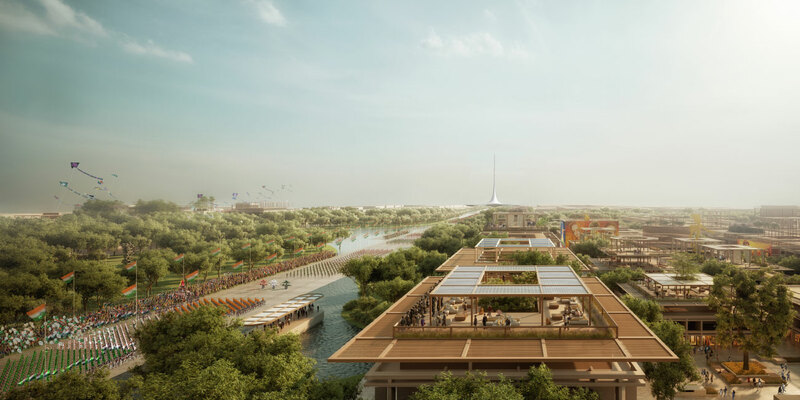 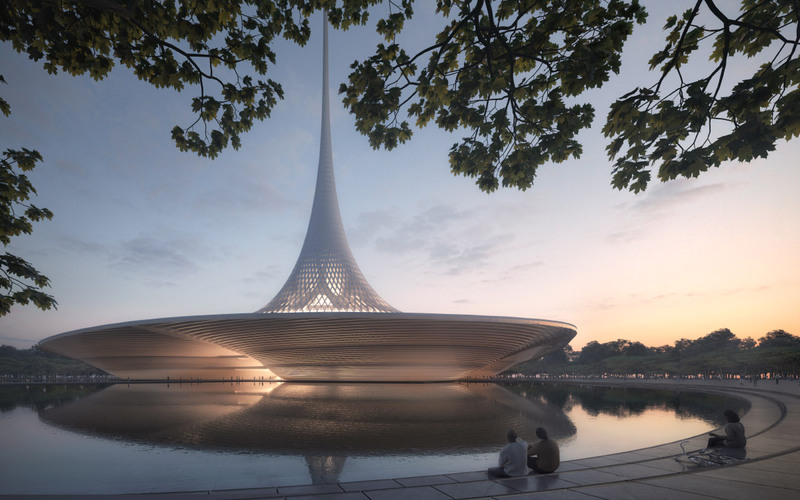 Amaravati, the new state capital of Andhra Pradesh, India (formed in a recent redrawing of state boundaries), is set to rise as a sustainable smart city, and Foster + Partners will master plan the green “spine” running through its administrative core. 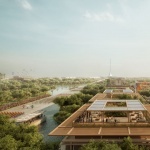 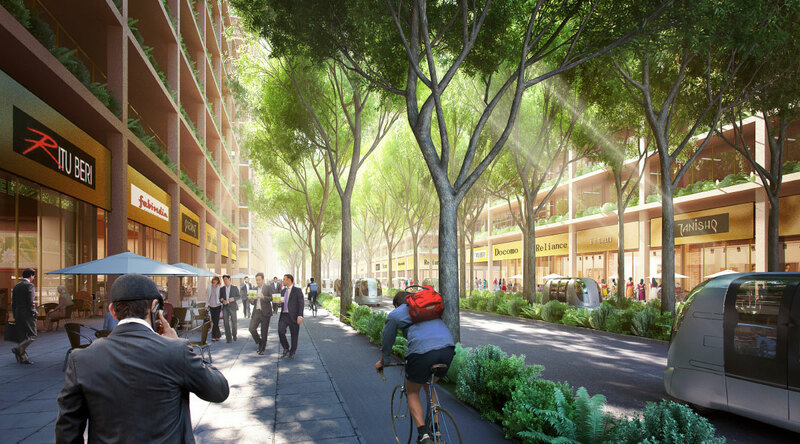 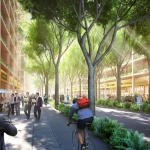 The 134-square-mile city is being positioned as one of the “most sustainable in the world” according to Foster + Partners, thanks to widespread solar power, electric vehicles, dedicated cycling routes, and shaded paths to encourage walking. 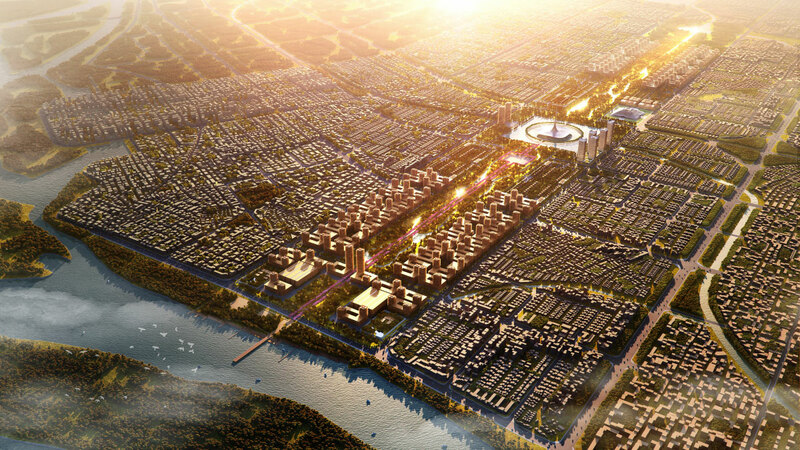 The city was strategically positioned on the banks of the River Krishna for easy access to fresh water, and water taxis have been floated as mass transit options. 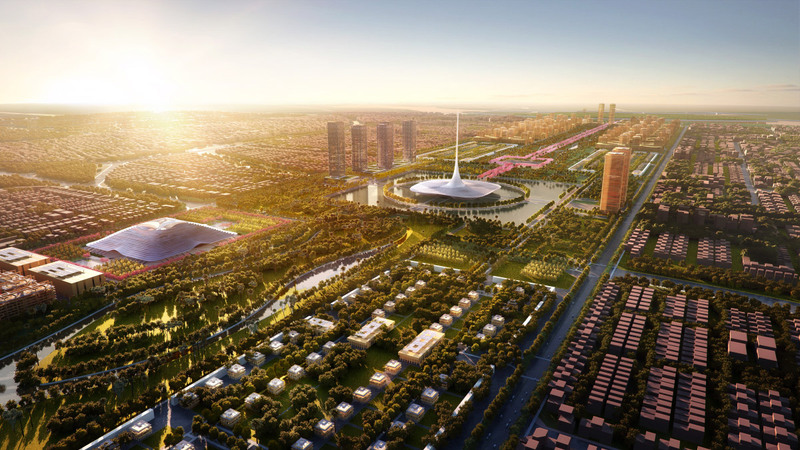 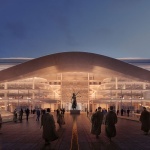 The 3.4-mile by half-mile stretch that Foster + Partners will be planning holds the city’s central governmental complex, including the design of several administrative buildings, and most importantly, the legislative assembly and the high court complex. 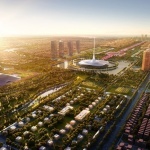 The green spine will be at least 60 percent occupied with either greenery or water, and Foster + Partners claims that the area, centered in a city with a strong urban grid, was inspired by Central Park and Lutyens’ Delhi (an area of New Delhi designed by British architect Edwin Lutyens). 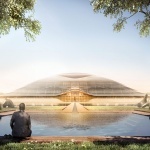 The legislative assembly building will sit inside of a large freshwater lake at the spine’s center and appears to be floating over the water’s surface. 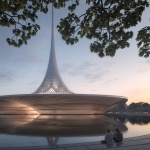 Keeping the Hindu principles of vastu shastra in mind, the building dramatically spikes 820 feet towards the sky at its core and creates an internal void. 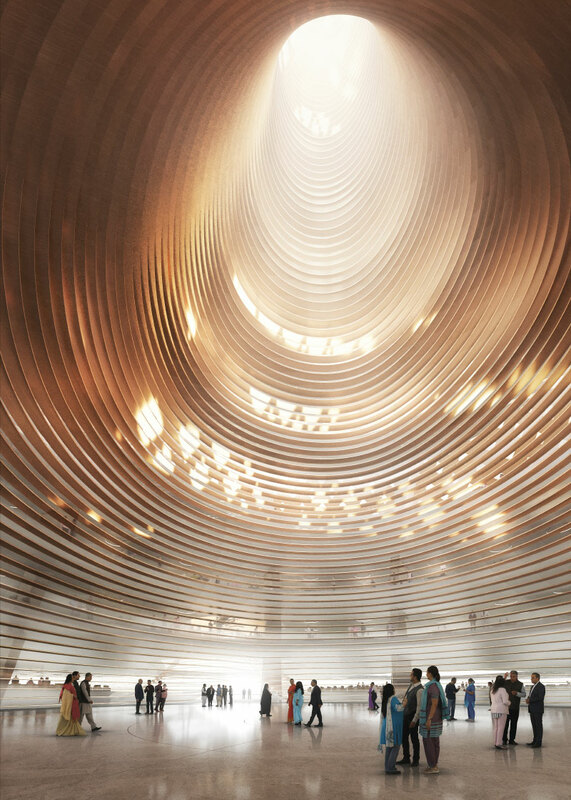 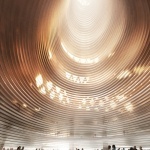 The space below inside of the assembly building will be used as a courtyard, while visitors can climb a spiral ramp to a cultural museum and viewing gallery on the upper levels. 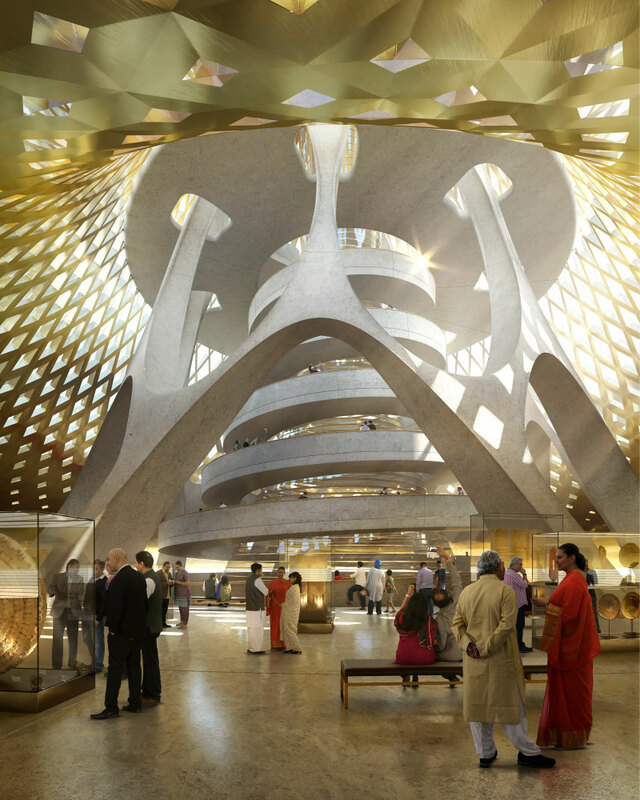 The high court complex is located off of the spine’s central axis, and the building’s stepped, dome-shaped roof references Indian stupas; domed buildings typically containing Buddhist relics. 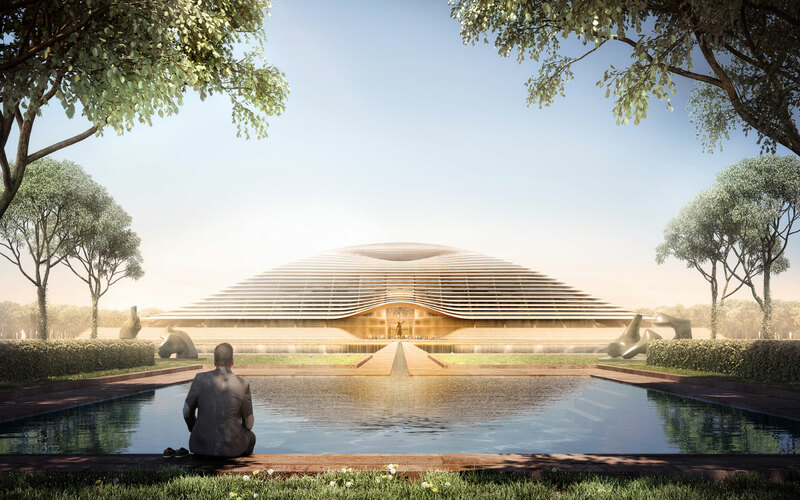 Generous overhangs encourage natural, passive cooling throughout, and the programming is made up of concentric circles of circulation spaces and rooms. 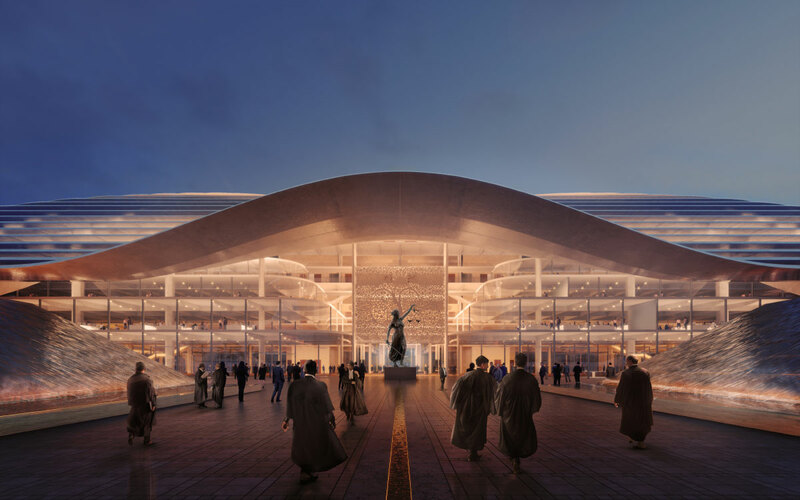 The public-facing sections will be at the exterior rings, while the most sensitive and private areas will be located at the heart of the court complex. 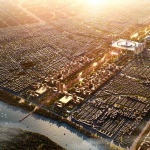 A mixed-use neighborhood has been planned for the area closest to the river’s edge, structured around 13 public plazas, each representing a state district in Andhra Pradesh.